The successful Scoutmaster is a big brother to the scouts in his charge. His role is important but, when done correctly, appears to be easy and not very crucial to what is going on. Fire Starting - Every boy likes fire. A scoutmaster able to create a fire with flint and steel, magnifying glass, battery and steel wool, bow drill, fire piston, ferrocerium sparker, ... gives scouts something to shoot for. Demonstrating the mystique of creating fire in so many ways shows scouts there are many ways to accomplish a goal. See Starting Fires page. Story Telling - Sitting around a campfire, after the scouts have run their campfire program, has been some of the most fun I've had in Scouting. A campfire without stories gets boring fairly quickly. Having a few stories ready to prime the pump of the scouts' imaginations, and being able to tell them well, keeps these times interesting and entertaining. Hearing an experienced scout tell a tale to younger guys and realizing he had first heard it from me a few years earlier is one of those fine rewards we get. Walking - Being in good shape so you can walk around camp with the scouts, backpack, and participate in day hikes is essential to fulfilling the role. Walking is the way scouts explore the wild places and that is where we need to be. Iron Stomache - Some scout concoctions created for cooking competitions can cause cancer, canker sours, and cardio concerns. Scoutmasters, often asked to sample food, need to be able to digest a wide range of flavors and textures. Sense of Humor - Knowing whether to laugh or cry will keep you sane, or at least help a bit. The more broad your sense of humor, the more you will enjoy scouts. See Silver Linings - It's easy to view every lashing project that falls apart, every burnt meal, every 57-match fire, and every mis-navigated hike as a complete failure. A scoutmaster sees the one knot that held, the cajun flavoring, the 193 extra matches in the box, and the extra map and compass work as successes. It's those small successes that gradually build on each other until a scout is self-sufficient. He doesn't join the gang as an expert - if he did, scouting would offer him nothing. Listening - Scouts, being boys, often don't communicate effectively or even in complete sentences. A grunt, shoulder shrug, or look of the eyes may be all a scout has to say. Being able to listen to this, and hear what's being said, helps a scoutmaster be that big brother needed more by this sort of scout. 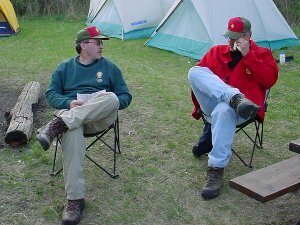 Sit On Hands - Whether it's an exciting game, food preparation, setting up a tent, or leading a meeting, the scoutmaster that can refrain from getting involved is a step ahead. The fun, challenge, and success of Scouting is for the scout, not the adult volunteer. Live Vicariously - Since the scoutmaster refrains from direct involvement in most scouting activities, he must enjoy watching the accomplishments of others. Some adults push their children too hard to excel and the scoutmaster can't do that. He should make opportunities available, encourage scouts to achieve, and appreciate their attempts. Visiting with past scouts that are home from college, and believing that Scouting has helped prepare them for life, is about the best pay I could expect. Selective Deafness - This is most valuable at night. If you can't sleep through snoring, night noises, and giggling, you will be a grumpy, old scoutmaster way before your time. Ear plugs are an alternative if you are still working on this skill. What other skills have you found especially helpful in your role as a Scouting volunteer? You have to be there. Not just physically but mentally. You have to be invested in the Scouts and the program. They will know if you are not, and it will reflect in what they do and how they run their meetings. You have to be prepared for the meeting/outing/banquet you are at, and getting ready for the next one. But most of all, you have to be there.